April 3, 2012 | David S. Maldow, Esq. Enterprise Connect 2012 was a blast. While many vendors may be saving their big announcements for InfoComm in Las Vegas in June, the usual suspects were in attendance this month in Orlando and happy to show off their goods and talk about their future plans. We can start our review the same way most show attendees started their booth crawl, which is with Cisco since they had a massive footprint, positioned near the entrance. They featured a full enclosed room (shown above, behind the reception desk) housing their new TX9000 Telepresence system. Their exhibit also included several rows of products and monitors (below right) connected to a variety of services and solutions. They also appeared to have pulled out no stops with event staffing, as they easily had enough staff to accommodate numerous simultaneous demos, with more ready to pounce on offer help to wandering attendees. The TX9000 (above left) was clearly a highlight, not only of the Cisco booth, but of the entire show. People were literally lining up outside of the demo room, peeking in the windows while waiting their turn. The interest was understandable as Cisco currently claims to have the most immersive telepresence rooms deployed in the world. It is fair to assume that this new model will generate a lot of revenue, regardless of its feature set. That being said, most of the analysts I talked to did seem pleased, if not overwhelmed, by the TX9000's improvements over the CTS 3000 and I tend to agree. I did make sure to peek behind it to verify that the claims of its cleaner cabling are true. 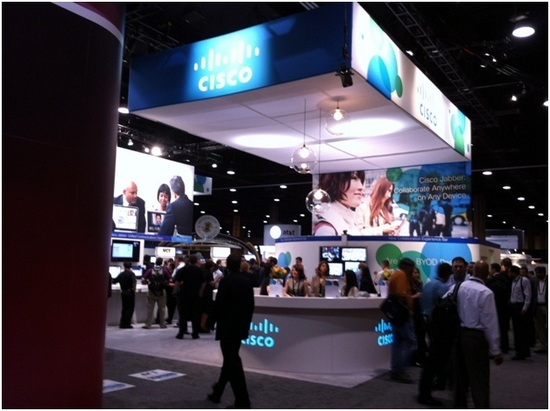 Cisco's exhibit was part of a group of heavy hitters clustered at the front entrance. 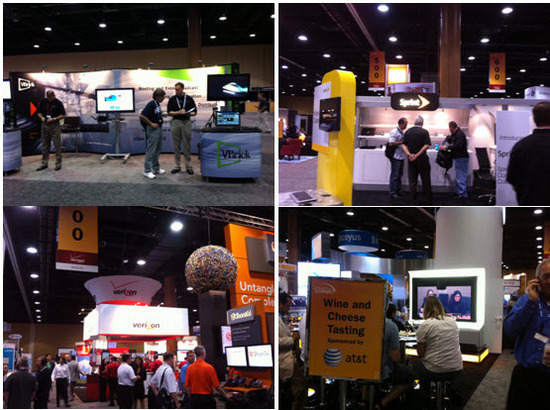 Avaya, HP, Siemens and NEC were also positioned to grab the attention of attendees as they first hit the floor. The battle-lines for the UC war have been clearly drawn, with Cisco and Avaya giving dueling keynotes at EC on their offerings and vision. Microsoft Lync was at the epicenter of the event, both physically (see above) and figuratively. 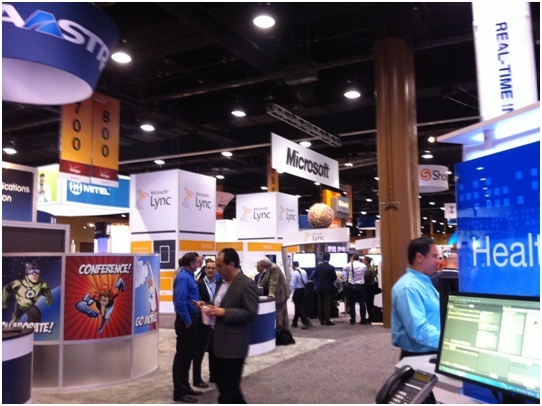 Microsoft's booth was entirely dedicated to Lync and hosted some unexpectedly cool demos. But in some ways was almost unnecessary. With so many vendors touting their exiting or pending Lync integration, Microsoft would have been a major focus of the show even if they had stayed in Redmond. Like it or not, Lync integration has become almost a de facto requirement for collaboration solutions. Avaya was particularly clever in its use of advertising, doing everything from showing that no surface is safe from an Avaya display (above left) to using a Star Wars text crawl in its booth guaranteed to stop a nerd like me in my tracks (above right). Of course, my main interest in Avaya was playing with their Flare interface and poking about for information regarding the Radvision acquisition. Speaking of Radvision, they had a "Telepresence Cafe" set up with a bar facing their Scopia XT Telepresence solution (above left). As expected, the video quality was excellent. 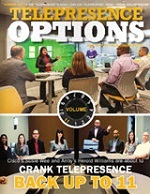 However, I would recommend some design tweaks to better accommodate the human factors of a telepresence experience. For example, the cameras could be much lower, which would somewhat improve eye contact. I had the opportunity to speak with Bob Romano (VP Global Marketing, above right) about how the Avaya acquisition of Radvision is such a great fit for both companies. As I have previously written, Radvision's products have always been solid and worthy of greater marketplace performance than they ever realized. Hopefully with Avaya's name and channel, Radvision's technology can finally reach its full potential. Bob was also kind enough to show me the recently announced Scopia XT5000 endpoint, the video endpoint whose spec-sheet can't help but impress. I was aware of this endpoint, and knew that it included a wish list of features (1080p60 video, H.264 High Profile, SVC, embedded 9-way MCU, etc. ), but I had no idea how small it is. This powerhouse is the size of a Nintendo Wii! See above right as Bob Romano holds up a Scopia XT5000 and smiles at my jaw dropping over its size. Bob and I also discussed Radvision's MS Lync gateway. As I stated above, many vendors were touting their Lync integration, but Radvision has been ahead of the curve. In fact, Radvision had an integration solution when Lync was still known as OCS. At that time they were using their own Scopia desktop to compensate for OCS's lack of a video client. With Lync having internal video, Radvision was able to shift over to their current, simpler gateway integration. 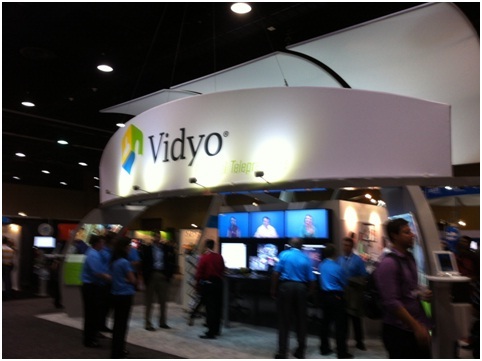 Vidyo was showing off their Panorama solution at their booth and talking about virtualization. I had the opportunity to chat with Marty Hollander (Senior VP, Market Dev.) about Vidyo's latest news. One big piece of news was the release of their virtualized router. Telepresence Options had tested this back in November of 2011, when it was still in beta, and we were excited about the implications at that time. One key differentiator between the virtualized VidyoRouter and some competitors is that Vidyo has virtualized the media plane as opposed to simply virtualizing the signaling of media connections. In other words, some competitors who claim to be virtualized are still relying on physical infrastructure (hosted MCUs) to process the actual media. Virtualizing the media plane means much greater scalability and ease of deployment. We also discussed their related new reseller program, which creates a new group of partners called Vidyo Virtual Network Operators (VVNOs) who can offer Vidyo as a service either to MSPs or directly to end users, greatly simplifying deployments of infrastructure free videoconferencing. LifeSize and Logitech shared a well trafficked exhibit featuring many of Logitech's peripherals and demos of LifeSize's communications offerings. 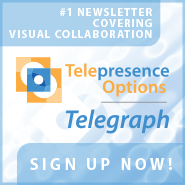 Having recently covered the new LifeSize Connections solution I was interested in learning about their also newly announced UVC offering. A quick look at the UI verified that UVC has the same ease of use as all LifeSize products. LifeSize gurus Julie Zellman and Cari Zoch (above right) helped me figure out the relationship and strategy behind these two offerings as I was a little confused about how an enterprise would use them together. Turns out, they are not designed to be work together as part of an overall deployment, they are disparate products designed for different types of customers. UVC is intended as a complete infrastructure for a large enterprise deployment, while LifeSize Connections is designed as an easy and affordable way for SMBs to dive headfirst into videoconferencing. While at the exhibit, I let LifeSize turn the tables on your humble reporter and interview me about my time at the convention. After watching the brief interview on YouTube (http://lfsz.vc/aaaM8A) I have decided that it is much less stressful to be the one conducting the interview, and that I speak much too quickly when I am nervous. If I choose to be an auctioneer in my next career, I will have LifeSize to thank. At AGT's booth I spoke with Mike Valletutti (CEO) about a number of new developments including their recently announced strategic partnership with Yorktel. 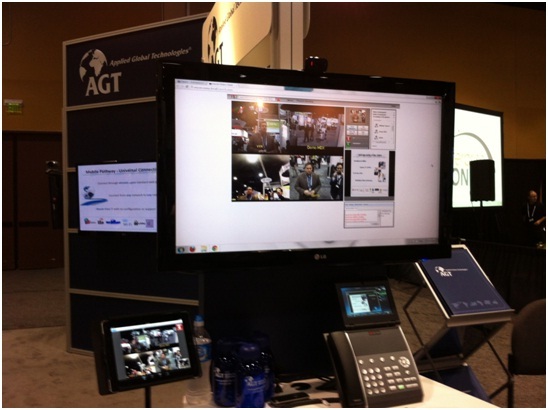 I was particularly impressed with AGT's "any device, anywhere" Encore UC and PerfectMeetings video platforms. Many enterprise video solutions are designed to only work behind the corporate firewall. This results in employees using one solution while at the office and another, consumer solution (such as Skype) when on the road. Life is complicated enough, so AGT allows workers to use the same business class solution they use at work at any location and on any device. As Mike explained, it is not just BYOD, it is BYODA (Bring Your Own Device Anywhere). The SMART Technologies booth was very popular. Every time I walked past their booth, there was a huddle of users around their demo boards. It is worth mentioning that SMART Boards were in use in many booths at the show. This is no longer seen as just an educational tool, but as a natural compliment to videoconferencing in a fully collaborative environment. Even Cisco was using a SMART Board for at least one of the demo areas of their exhibit. To further encourage business adoption SMART has created templates (see your intrepid analyst working with a development template, above right) within the standard version of their software for many business uses, including basic flow charts, decision making, engineering, human resources, development management templates, etc. With this new addition to their software, users can simply load up the correct template and get right to work. ClearOne was in attendance, with a booth full of their excellent audio peripherals. While the ClearOne acquisition of VCON was too recent to expect any results at this convention, we do look forward to seeing ClearOne's integration of VCON's video technology in action. Vidtel and StarLeaf are both notable in my mind as being the vendors that the other vendors were asking about. Vidtel had a very interesting presence at the show because when the Vidtel team looked around the show floor, they saw potential partners rather than competitors. Their goal is to provide a service that allows users of all videoconferencing endpoints and clients to connect (another approach at anytime, anywhere, any device). Their ability to allow conferences between standard based H.323 devices and the Google Chat consumer video client makes them one of the few true B2C (business to consumer) plays. This also makes them part of any discussion about Blue Jeans Network, the other hot B2C solution in the industry. StarLeaf is a very interesting company, which I first covered at InfoComm 2011. Created by the industry visionaries behind the Codian MCU, the StarLeaf solution beats the adoption hurdle posed by people habitually using the phone, by making the phone the centerpiece of their solution. You don't make a StarLeaf video call INSTEAD of using your phone. You make a StarLeaf video call BY using your phone. StarLeaf recently announced a hosted service, allowing customers to simply buy StarLeaf endpoints, without requiring them to purchasing and manage any physical infrastructure. Their video PBX is still available for consumers who prefer hardware over hosted. There were too many other booths to give them all the coverage they deserve. VBrick was there demoing their award winning streaming solutions, while AT&T hosted a wine and cheese tasting party over telepresence. Providers like Verizon and Sprint were there to push the anywhere, anytime, mobile mantra. Much to the puzzlement of many show attendees, Polycom did not bring the big guns to Enterprise Connect. In fact, they didn't even bring the little guns. 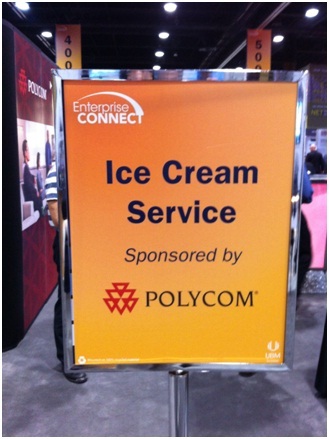 There was no Polycom hardware on display at their booth. Polycom's entire EC presence was based on sending attendees to the booths of their partners who were demoing Polycom RealPresence integrations. While we appreciate the fact that Polycom is embracing the service based, software centric future, the fact is that hardware is far from dead and they should be proudly showing off their stuff. This is especially true at shows where their main competitors are displaying rows and rows of products. In addition to the exhibit hall itself, there were plenty of interesting sessions in the conference rooms. 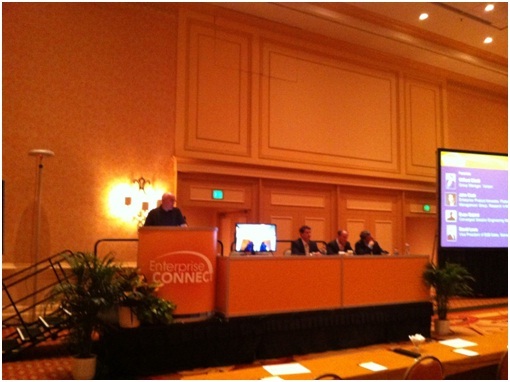 In the picture above, Andrew W. Davis from Wainhouse Research hosts a panel on home telepresence. Note that one of the panelists is attending remotely via videoconferencing. We don't just talk about VC at Enterprise Connect; we use VC to talk about VC! Although Blue Jeans Network did not have a booth, they were on everyone's mind as a potential disruptor to the hardware infrastructure paradigm. I was extremely pleased to meet with Blue Jeans co-founder, CEO, and visionary Krish Ramakrishnan. For a man with his incredible track record, Krish was refreshingly down to earth. When I complained about the fact that I was wearing "business pants" while he was able to get away with wearing blue jeans, he replied with a perfectly straight face, "But David, blue jeans works with everything." We discussed their new MCU Killer offering as well as some not ready to be released plans for the future. If Blue Jeans isn't already on your "keep an eye on these guys" list, they should be. I also spoke with David Danto from Dimension Data. His wrap up of the conference can be found here. David gave me the rundown on Dimension Data and their new managed services for visual communications (MSVC) offering. Dimension Data is the second largest telecommunications company in the world, with $5.8 billion in 2011 revenues. Their completeness of vision and ability to execute has recently landed them in the "leaders" section of Gartner's Magic Quadrant. Their massive resources and experience make them uniquely suited to be a one stop shop for enterprises from the initial project assessment phase, through procurement and installation, and continuing with managed services. Sam Liu (VP Marketing) from Partnerpedia helped me to understand his company's offering. In the simplest of terms, Partnerpedia offers enterprise app management. Employees are installing all types of apps on a variety of devices at the workplace and IT needs a way to control and manage it all. Partnerpedia offers a white labeled Enterprise App Store (EAS), similar to the already existing Apple or Android app store on your device but managed by your company's IT staff. This gives control back to the IT team, and makes things simpler for employees as well. Rather than trying to keep up with a constantly changing list of approved apps, employees feel secure knowing that any app within the EAS is approved and ok to use in the workplace. Furthermore, it is a model that users will tolerate, as nothing is blocked or removed from their devices. I also spoke with Wei Tang (Dir. Product Management) from Huawei to discuss their new "Full-View Telepresence" solution. The solution appears to be very compelling with a lot of attention given to the human factors of telepresence. For example, the bezels between the screens are much smaller, which may help to trick the mind by hiding the fact that the user is really sitting across from monitors and not actual people. The use of H.264 High Profile will reduce bandwidth requirements, allowing them to provide 720p while only using 768k per screen, or 1080p at only 1M. They are also working very hard on interoperability with standards based H.323 systems and the Cisco TIP protocol. While some of this is roadmap, the idea is that enterprises with existing telepresence rooms and infrastructure will be able to drop in a Huawei system as easily as a system from their original vendor. Final Thought: I am calling it now; the iPad will be THE mobile videoconferencing platform for 2012 and the foreseeable future. A lot of vendors were talking about mobility, but it was clear they were really talking about the iPad and smart phones. And since smart phones are too small to be a primary VC endpoint, that leaves the iPad. Other tablets just aren't a consideration. If a booth at EC had a drawing, the prize was almost always an iPad. One vendor had a drawing for their proprietary tablet and people were hesitant to sign up for it, as if they didn't want to waste their luck by winning a non-iPad tablet. As one attendee put it, "Wow, that tablet would be a horrible thing to win." Message to vendors, don't get too attached to your proprietary tablets and make sure your app runs amazingly well on the iPad. All in all Enterprise Connect is a great show. The industry is clearly undergoing several transformations at once (hardware to software, internal to service managed, room based to mobile, etc) and many vendors appear to be welcoming the challenges associated with these changes. The best news from EC is that almost everything that I saw will wind up benefiting the end user in the long run. Speaking of Radvision, they had a \"Telepresence Cafe\" set up with a bar facing their Scopia XT Telepresence solution (above left). As expected, the video quality was excellent. However, I would recommend some design tweaks to better accommodate the human factors of a telepresence experience. For example, the cameras could be much lower, which would somewhat improve eye contact. I had the opportunity to speak with Bob Romano (VP Global Marketing, above right) about how the Avaya acquisition of Radvision is such a great fit for both companies. As I have previously written, Radvision's products have always been solid and worthy of greater marketplace performance than they ever realized. Hopefully with Avaya's name and channel, Radvision's technology can finally reach its full potential. At AGT's booth I spoke with Mike Valletutti (CEO) about a number of new developments including their recently announced strategic partnership with Yorktel. I was particularly impressed with AGT's \"any device, anywhere\" Encore UC and PerfectMeetings video platforms. Many enterprise video solutions are designed to only work behind the corporate firewall. This results in employees using one solution while at the office and another, consumer solution (such as Skype) when on the road. Life is complicated enough, so AGT allows workers to use the same business class solution they use at work at any location and on any device. As Mike explained, it is not just BYOD, it is BYODA (Bring Your Own Device Anywhere). Although Blue Jeans Network did not have a booth, they were on everyone's mind as a potential disruptor to the hardware infrastructure paradigm. I was extremely pleased to meet with Blue Jeans co-founder, CEO, and visionary Krish Ramakrishnan. For a man with his incredible track record, Krish was refreshingly down to earth. When I complained about the fact that I was wearing \"business pants\" while he was able to get away with wearing blue jeans, he replied with a perfectly straight face, \"But David, blue jeans works with everything.\" We discussed their new MCU Killer offering as well as some not ready to be released plans for the future. If Blue Jeans isn't already on your \"keep an eye on these guys\" list, they should be. I also spoke with David Danto from Dimension Data. His wrap up of the conference can be found here. David gave me the rundown on Dimension Data and their new managed services for visual communications (MSVC) offering. Dimension Data is the second largest telecommunications company in the world, with \$5.8 billion in 2011 revenues. Their completeness of vision and ability to execute has recently landed them in the \"leaders\" section of Gartner's Magic Quadrant. Their massive resources and experience make them uniquely suited to be a one stop shop for enterprises from the initial project assessment phase, through procurement and installation, and continuing with managed services. I also spoke with Wei Tang (Dir. Product Management) from Huawei to discuss their new \"Full-View Telepresence\" solution. The solution appears to be very compelling with a lot of attention given to the human factors of telepresence. For example, the bezels between the screens are much smaller, which may help to trick the mind by hiding the fact that the user is really sitting across from monitors and not actual people. The use of H.264 High Profile will reduce bandwidth requirements, allowing them to provide 720p while only using 768k per screen, or 1080p at only 1M. They are also working very hard on interoperability with standards based H.323 systems and the Cisco TIP protocol. While some of this is roadmap, the idea is that enterprises with existing telepresence rooms and infrastructure will be able to drop in a Huawei system as easily as a system from their original vendor. Final Thought: I am calling it now; the iPad will be THE mobile videoconferencing platform for 2012 and the foreseeable future. A lot of vendors were talking about mobility, but it was clear they were really talking about the iPad and smart phones. And since smart phones are too small to be a primary VC endpoint, that leaves the iPad. Other tablets just aren't a consideration. If a booth at EC had a drawing, the prize was almost always an iPad. One vendor had a drawing for their proprietary tablet and people were hesitant to sign up for it, as if they didn't want to waste their luck by winning a non-iPad tablet. As one attendee put it, \"Wow, that tablet would be a horrible thing to win.\" Message to vendors, don't get too attached to your proprietary tablets and make sure your app runs amazingly well on the iPad.